Hi, posting late tonight, as I attended a tax update seminar today. 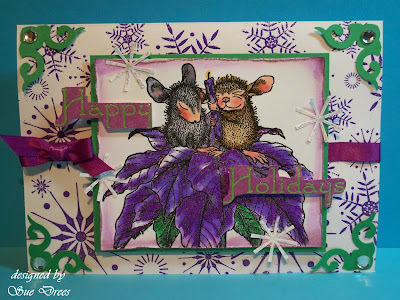 Today's card is for the House Mouse challenge which is to make something Christmas in non-traditional Christmas colors. 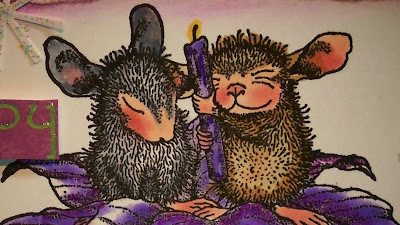 Your little housemouse card is adorable. You always have such unique and beautiful cards! Love this one. Coloured so perfectly! Love the blog banner at the top. Very pretty! So beautiful card Sue,i love your image and colours. I cannot imagine how many stamps you must have or where you keep them all. How very cute, Sue! Love the purples and greens, very creative! I kind of agree with ArchivingAngel, I think you have me beat in the stamp collection and I have a lot, LOL! Awwwwww, sooo squeakin' cute!! Lovin' those colours, the purples look fantastic!! That's it!! I HAVE to do a mousey creation!! I hope you are warmer than we are down here in Wichita, 10 damn degrees right now!! Never would have thought to change this up to Purple...very creative and lots of fun! Oh, my goodness, I can't think of a more luscious coloring to use than what you have done here -- it is just extra special. The colors you chose were sooo awesome.... love it!